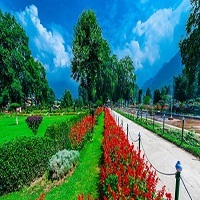 "Shalimar Bagh (Hindi: à¤¶à¤¾à¤²à¥�à¤®à¤¾à¤° à¤¬à¤¾à¤�à¤¼; Urdu: Ø´Ø§Ù�Û�Ù�Ø§Ø± Ø¨Ø§Øºâ��) is a Mughal garden in Srinagar, linked through a channel to the northeast of Dal Lake, on its right bank located on the outskirts of Srinagar city in Jammu and Kashmir. " Its other names are Shalimar Garden, Shalimar Bagh, Farah Baksh and Faiz Baksh, and the other famous shore line garden in the vicinity is Nishat Bagh. The Bagh was built by Mughal Emperor Jahangir for his wife Noor Jahan, in 1619. The Bagh is considered the high point of Mughal horticulture. It is now a public park. This time it's also called as crown of Srinagar. While the recent history and development of the Mughal types of gardens is credited to Emperor Jahangir, the ancient history of the garden can be traced to the 2nd century when it was built during the reign of Pravarsena II.